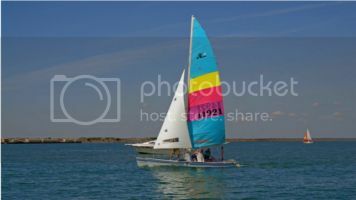 I have a 1979 hobie 18 and the sail is in good condition for its age. In a few spots it appears that the thread is failing, are their any known problems if I sew over existing seams and over the spots that are starting to fail? If not, do I need to use a sail specific thread? And what material is the sail made out of? I'd like to buy a small amount and reinforce the batton pockets to provent further wear and tear. No problems reinforcing seams, use sail thread, sails are dacron. You will need a tough needle and something to push it with. Most home sewing machines can't handle the reinforced regions. I've done several small repairs to my sails by just using a hand needle and thread. It takes some time, but is pretty easy. It helps to have a pair of needle nose pliers to pull the needle through. By sewing with a hand needle, you can go right back through the existing needle holes. This is advantageous, especially with an older sail, because you aren't punching a bunch of additional holes in the sail which can potentially weaken the fabric. Nylon sail thread is preferred, but in a pinch, you can even use dental floss. As others have said, your sails are Dacron and can definitely be resewn or restitched by hand. Dacron is the brand name (owned by DuPont apparently); it's essentially just a polyester fabric (though with a very tight/stiff weave). Any sailmaker or sail shop will likely have some spare material/scraps they can give you, and I'm sure you could find it online too, but new dacron is noticeably stiffer than older/worn dacron. A sail loft can also reinforce the batten pockets for you. The Dacron is often sold in different weights/thicknesses. I believe the main & jib sails on Hobies are made from 6oz Dacron. If you have $400 or so and want to go to the trouble, you can get a pretty decent walking foot sewing machine that will go through most sailcloth and even some of the reinforced areas. Go to eBay and search for walking foot sewing machine...any of them will do--most are made in the same factory as the Sail-rite ones that cost twice as much. V69 polyester thread or V92 polyester thread is preferred. You may find that the 400 is well spent (I did) since I repair lots of stuff and make new tramps and sails now. IF you can find the right colors, you can save some time by purchasing insignia cloth which is polyester cloth with a very aggressive adhesive on one side. That's what your sailmaker's logo and sail numbers are attached with in most cases. If you go with insignia cloth clean the area well with soap and water, then one more time with some solvent and allow to dry thoroughly before putting on the patch over older sailcloth. I don't know though, at $400 you could just get a used replacement sail on ebay in okay condition. I'd rather put that kind of money towards a new sail... New H18 mainsails from a good 3rd party source start around $750, and from Hobie around $1,220 ... hadn't looked that one up in a while! By the time the batten pockets and stitching start wearing out in earnest, a new sail is probably going to be more worthwhile than replacing the stitching or renewing the pockets. My main is just getting to that point at 30 years old! A lot depends on how you do your hobbies. Some folks enjoy the maintenance/repair of their boats, some just like to sail them. I'm in the former camp. Besides, ain't nothin' prettier than a sail that you made yourself. I have a Speedy Stitcher (http://www.speedystitcher.com/) from former backpacking days. Has anyone used one of those for small repairs? True unless you shop eBay and are willing to buy Chinese. I have made many sails and trampolines for several boats and never spent more than 400 on a walking foot. I have made many sails and trampolines for several boats and never spent more than 400 on a walking foot. Ahhh, now that makes more sense! I was thinking in terms of cost for one repair. If you're going to be repairing/making a number of sails and trampolines, buying a dedicated sewing machine for it makes a lot more sense! I've spent plenty of time on the hulls between the bottom jobs, soft spot repairs, deck lip separation and reconditioning the gel coat. When it comes to the sails, I'd just rather buy a set and get out on the water!